The App "Gentle Wakeup" is a sunrise simulator for Android which wakes people up by light. The artificial daylight can make waking up feel as in summer while it is still dark in the morning. Getting out of bed, while it is still dark outside, is a challenge. Most people feel tired and exhausted even though they have slept enough. This is because the missing daylight could not initiate any wake-up processes in the body. The App "Gentle Wakeup" compensates the short daylight by turning any Android device into a sunrise simulator. The device is put on a nightstand and brightens the room 20 minutes before wake-up time. The body will switch into a light sleep phase and prepare for wake up just like on a nice summer day. The flashlight is turned on constantly to increase the effect. Other wake up methods such as sound and vibration are supported as well and increase gently. The sounds can be the twittering of birds, a crackling fireplace, ocean waves or a favorite song from the playlist. Vibration will start with a very short length and will reach maximum intensity at the end to ensure that the alarm is not missed. After dismissing the alarm, a wake up show is started. An animation shows the weather and temperature for the morning, noon and evening and the felt temperature which is influenced by wind and humidity. The slowly increasing light, sound and vibration effects will not only lead to a gentle wake up but can also prevent other people in the room from waking up. The app is freely available for Android. ChangeMyStyle.com is owned by the Indie Developer Dr. Rieger. Products started in 1999 with photo effects for Windows computers and have won several awards during the years (http://www.graphics-tools.com). Started app development in 2012 for iOS. Since then lifestyle utilities, quiz games and over 1000 photo effects have been released. The app "Quiz Hero" has a new gameplay concept where multiple users can compete in one group. Whenever people get together for parties, coffee breaks or school breaks, anyone can participate and try to rank high in the league table. There was this one thing which bothered the Indie Developer Dr. Rieger with other quiz apps: "If you met with your friends and wanted to quiz you could only compete against one of them in a single game. Would it not be nice to have all of them in a group match?" After one year of endless programming and lots of coffee the App Quiz Hero was born. Quiz Hero is a multiple choice quiz game which can be played online against people from all over the world. A player can create a quiz group with friends and everybody is asked the same questions in each round. A ranking table, just like the ones used for sport leagues, shows who is ahead of the others and who is climbing up or down the charts. Players can test their knowledge in 9 different categories including TV & film, music and sports. The questions are suitable for a worldwide audience and tried-and-tested in hundreds of quiz games. A quiz game consists of 4 rounds with 5 questions each. In every round a new category can be chosen by a random player. A question must be answered within 25 seconds and there are 4 answers to choose from. But there was another thing which bothered the developer: "People have different demands about the game speed. Some people do not want to wait the whole day for an opponent to respond, while others only have time in the evening to play a few rounds. Quiz Hero allows the game creator to select a response time between 10 minutes and 48 hours." The app has a very detailed statistics analysis. It shows overall statistics about how many games, rounds and answers a player won or lost and friend statistics which compare only matches where a specific player participated. This means that even if a player does not rank first in a league game it is still a victory against all others with a lower rank. Next features of the game will focus on community integration such as questions written by users, rating of questions, and translations into other languages. The app is freely available for iOS and Android. ChangeMyStyle.com is owned by the Indie Developer Dr. Rieger. Products started in 1999 with photo effects for Windows computers and have won several awards during the years (http://www.graphics-tools.com). Started app development in 2012 for iOS. Since then over 1000 photo effects have been released. In 2015 the product focus is on different type of quiz games which can be played in online groups. 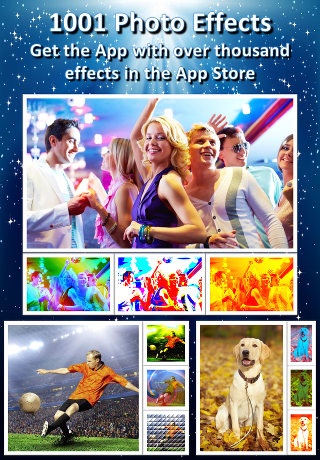 1001 Photo Effects: Free iPhone and iPad app with over one thousand photo effects! Upload photo, select effect, send altered photo to friends – done. It does not get much easier. The new app “1001 Photo Effects” can be used on the iPhone and iPad, completely free, and without in-app purchases. It is a great tool to optimize, alter and “spiff up” all types of photos, turning them into little works of art. The free app “1001 Photo Effects“ makes it possible: It changes an ordinary snapshot into an exceptional, unique work of art. 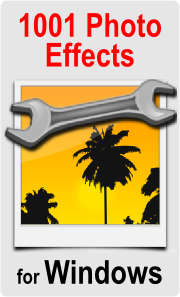 “1001 Photo Effects“ includes more than one thousand photo effects, which can be assigned to any image. They are divided into 38 categories, making it easy for the user to quickly locate the desired effect. Fire, kaleidoscope, poster and sand painted effects are just some of the many choices provided by the app to magically add a special touch to an image. All photo effects may be previewed and applied to selected photos on a trial basis. If the result is satisfactory, the app assists in e-mailing the altered photo to friends and relatives, as well as posting them on Facebook, Twitter, Instagram, Google+, and other social networks. Images may also be saved directly to the iPhone or iPad. In order to quickly locate particularly impressive effects at any time, the app will save them in a favorites list. All that is required is a simple tap with the finger. By the way, the free app also has a big brother. “1001 Photo Effects Pro”. The Pro Version offers 200 additional photo effects. Suitable for each effect up to eight sliders are available, so effect settings may be adjusted as desired. The advantage: The user receives an unlimited number of possible settings, allowing him to apply precise changes to a photo. Another option is to mask parts of a photo with the finger, to apply an effect only to those specified areas. The Pro Version lets the user save a combination of photo and effect. It simplifies locating an already assigned effect at a later time, in order to change it. The Pro Version is being offered at a promotional price of only $ 0.99. After the introduction phase the price will be increased to $ 4.99. Journalists that would like to test “1001 Photo Effects Pro”, should contact the press agency. We will supply you with a promotional code, which can be redeemed like an iTunes gift card. It allows you an automatic, free download of the app.